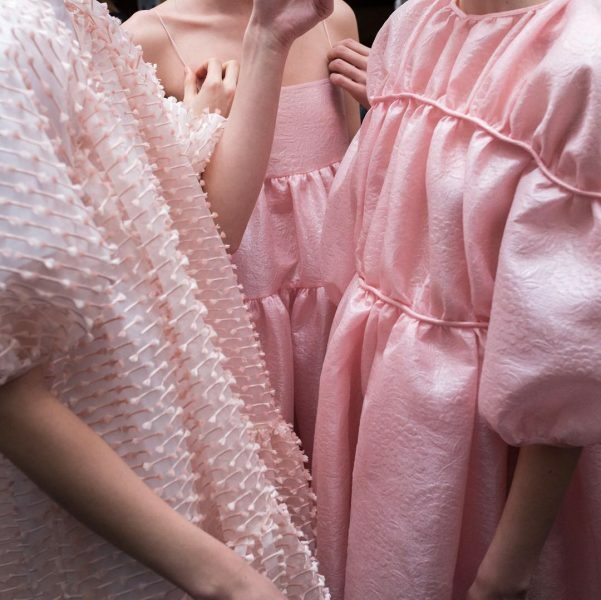 Copenhagen-based LVMH Prize finalist Cecilie Bahnsen‘s Instagram posts have been saved to my bookmarks for ages and I am pleased to finally share her designs with readers. Cecilie Bahnsen is a luxury clothing label based in Denmark. Drawing on a rich culture of design, the brand’s collections combine couture craftsmanship with sculptural silhouettes, reinterpreted for a contemporary audience. After graduating from the Danish Design School in 2007, Bahnsen worked as first assistant for Anja Vang Krag doing freelance work for Christian Dior in Paris as well as the Royal Danish Theatre in Copenhagen. From there she interned with John Galliano in Paris, where she was soon hired as a first line assistant and print designer. Her first collection was inspired by the super modern look of the 1920’s World Exhibitions in Paris and their illusionary conception of the future, combined with references to the 1990’s and how Cecilie used to dress as a teenager. Working in soft layers and ladylike materials, her first collection featured graphic print, shiny bomber jackets, and structured pleats. Today, her designs continue to be fanciful and soft, often including pouf sleeves, peplum, and dramatic silhouettes. Each garment is handmade with traditional techniques, intricate detailing and uniquely designed fabrics to present a timeless expression of modern femininity.